Alex and Miko Eala with their parents and UTP general manager Jackie Tomacruz. 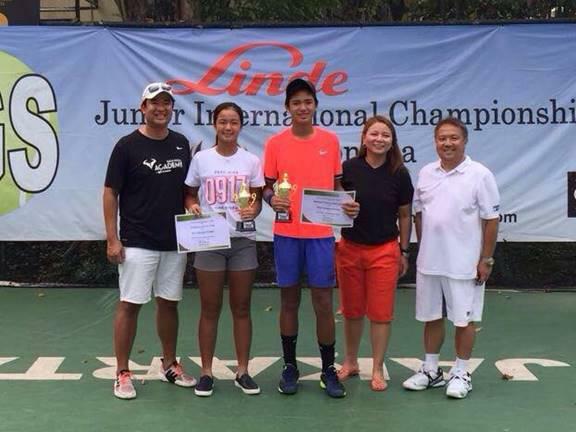 Unified Tennis Philippines National Junior Team players Alexandra “Alex” Eala and Michael Francis “Miko” Eala reached the finals of the International Tennis Federation (ITF)-AGS Junior Tennis Championships in Jakarta, Indonesia, beating higher-ranked players. The siblings, however, dropped their finals matches with Alex losing at the hands of top seed Priska Madelyn Nugroho from Indonesia, 2-6, 2-4, 2-6, while Miko yielded to top seed Ryoma Matsushita of Japan, 3-6, 7-6, 5-7. On their way to the finals, Alex, who recently turned 13, defeated older opponents such as Indonesian Nur Hadiati. Joleta Budiman, and Janice Tjen as well as AI Yamaguchi from Japan and Aesha Patel from the United States while Miko bested Kenneth Legacy, Muhammad Muzaqir, Karan Srivastava and Odeda Arazza from Indonesia, as well as Sohma Nakagomi from Japan. Miko also reached the semi-finals of the doubles competition. “We congratulate Miko and Alex for proving that the Philippine team is a force to reckon with. We also commend the rest of the UTP national team in this tourney for exhibiting great sportsmanship and passion for the sport. Rest assured that I and their UTP family will continue to support them,” said Jean Henri Lhuillier, Unified Tennis Philippines president. “Part of UTP’s mission is to continuously expose emerging Filipino junior tennis players to global competitions, thus giving them the opportunity to hone their skills on and off the court against some of the world’s best junior players,” Lhuillier adds.